Hera, Queen of the Gods, does not take her vengeance lightly – and if Wonder Woman is so foolish as to stand in the way of her whim, then Wonder Woman is her enemy. But it’s Hera’s daughter Diana should truly fear – the goddess of discord is coming to Paradise Island, and murder always follows in her wake! The Greek goddess of discord is Eris, and she’s definitely a handful, mythologically speaking. Remember the Trojan War? She pretty much started that. So yeah, she’s definitely not someone you want stopping by Paradise Island. Oh hey!! It’s Paradise Island again!! That’s super fun!! Anyway, if that’s Cliff Chiang’s Eris, I can’t wait to see him do the other Greek gods. I’m sure he and Azzarello will have a bizarre and fantastic take on all of them. I am SO jazzed for this book to start!!!! Wonder Woman is wearing pants here, despite changes to the cover of Wonder Woman #1. However, the pants appear drawn in such a way that they could easily be turned into briefs. The colouring for the metallic bits looks more gold than silver here, but I assume that’s just stylistic and not an actual change. The tiara, however, looks different from the one Wonder Woman is sporting in Justice League. But it did so on the cover for Wonder Woman #1 too. And I am glad… I like Chiang’s classic tiara style way better. Sidenote: Wonder Woman isn’t on the cover of Justice League #2… it’s just Batman, Superman, and Green Lantern. 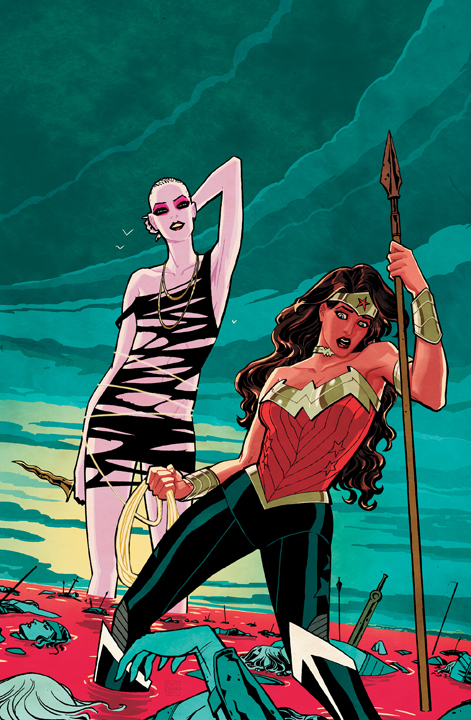 Wonder Woman #2 is out on October 19… go buy it because it’s going to be FANTASTIC. This entry was posted on July 14, 2011 at 5:21 pm and is filed under Comics, WW Comics. You can follow any responses to this entry through the RSS 2.0 feed. You can leave a response, or trackback from your own site.